European governments aren’t heading calls to establish safe passage for migrants and refugees, and people are dying because of it. A Médecins Sans Frontières vessel carrying individuals found at sea arrives in the port of Catania, on the island of Sicily on 21 March 2017. NurPhoto/SIPA USA/PA Images. All rights reserved. On 11 September 2015, as various ministers of home affairs were about to meet for yet another migration summit, Médecins sans Frontières sent an open letter to the heads of state of the European Union, Switzerland, Norway, the Former Yugoslav Republic of Macedonia (FYROM), Serbia, and to the President of the European Commission. This letter, entitled “Your fences kill: provide safe passage”, was sent together with life jackets recovered from ships assisted at sea by MSF teams and on Tunisian beaches. These orange life jackets, sometimes marked with messages of hope and phone numbers to be called in case of death, became a powerful symbol of the call for safe passage in Europe. Opening borders to people in need of protection should not be seen as a political act. It is a humanitarian imperative. At a time when the humanitarian crisis in Greece was escalating, when thousands of people were landing on Greek and Italian shores every day, when too many continued to be lost at sea and in the back of trucks, the call for a safe passage to and across Europe was a cry for change. After months of having rescued people from a certain death at sea, having assisted thousands of women and children every day in their chaotic crossing of European borders, having treated their physical and psychological wounds, MSF called for smugglers to be replaced by safe and legal alternatives. The safe passage we demanded was not limited solely to entry to Europe but also included the transit across European borders. Our call was based on the needs of MSF’s patients in Italy, France, Greece, Serbia and at sea. Instead of sealing borders with fences, we called on states to allow the safe and legal crossing at their sea and land borders. We called for states and the EU to provide access to fair and efficient asylum procedures at entry points and along migratory routes. Instead of squalid and overcrowded camps, we urged these states to offer dignified reception conditions for all. Had all these measures that we call “safe passage” been put in place, the need for sea rescue would have been dramatically reduced, as well as the medical consequences of what MSF calls a “policy-made humanitarian crisis”. Yet, in the toxic European political climate, calling on states to allow people to enter was perceived as highly political. Even within MSF, this call was somewhat controversial. Some in the organisation wanted to go further and thought this call too weak. Others believed we were going too far and were calling for a “Europe without borders”. They feared that this went beyond our traditional remit, which may come as a surprise for an organisation that has ‘without borders’ in the name. Thus a few MSF offices in European capitals were at first hesitant to promote the call. Still, the letter was published in 31 major newspapers in 19 countries. The call for safe passage should have caused little controversy. According to the 1951 Refugee Convention, refugees cannot be blamed for entering a country in an irregular manner and, in the context of entering Europe, they had no other option. Getting a visa is an impossible mission for most asylum seekers. The principle of non-refoulement – not sending people back to countries where they face danger – applies to all signatories of the convention, obliges state authorities to assess people’s situation at borders, and comes with the implicit duty to grant asylum seekers access to their territories. This obligation is the very reason why European states are building fences at their borders and are sending military boats to fight and intercept smugglers at sea. If a person never reaches the border, there is no triggering of the non-refoulement principle and the responsibilities that come with it. However, opening borders to people in need of protection should not be seen as a political act. It is a humanitarian imperative. With so many people dying at EU’s borders, border crossing should be facilitated, not made more dangerous. 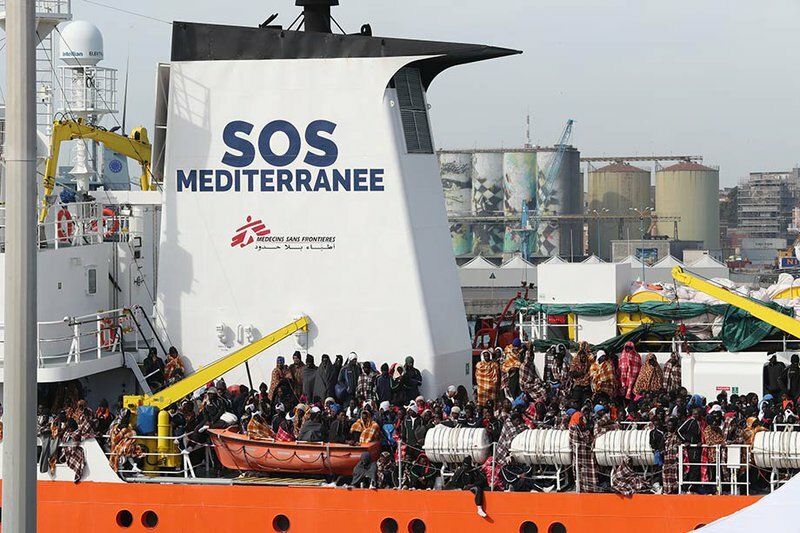 Despite these points of tension, there was however a large recognition in the organisation that the situation in Europe was unacceptable and that MSF had to speak out against the European policy of deterrence and its consequences. The “safe passage” open letter was followed this year by another letter condemning the EU-Turkey deal and by MSF’s decision to stop using funds from European governments and institutions. • The sea crossing between Libya and Italy claimed more lives in 2016 than ever before, despite a bigger presence of rescue ships. • The only safe passage from Turkey to the EU – resettlement – has been conditioned through the EU-Turkey deal on the forced return of Syrian refugees from the Greek Islands to Turkey. • The corridor allowing people to cross legally between Greece and Northern Europe without the help of smugglers has been closed since February 2016. • New fences have been or are being built by France and the UK, Hungary, FYROM, Austria, Norway and Bulgaria. • Border closures along the Western Balkan route have triggered extreme levels of abuse and violence. A third of MSF patients in Serbia report having experienced violent events on European territory. Half of these events reportedly occurred at the hands of state authorities. MSF teams at the Serbia-Hungary border have seen patients, including women and children, showing signs of severe beating, electric shocks and dog bites. • The 60,000 people stranded in Greece still do not benefit from fair and efficient access to asylum procedures or decent reception conditions. • Relocation and family reunification – the only safe and legal channels for some people to reach other European countries – are failing. Once again, smugglers remain the only option for them to access their rights to protection, assistance and a life in dignity. All of this translates into one concrete result: people will continue to risk their lives and health in search of safety. Now, more than ever, they need safe passage.